Joe. My. God. 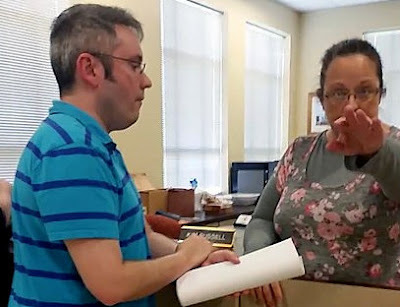 : KENTUCKY: Liberty Counsel Tells Court That Clerk Is A "Conscientious Objector"
KENTUCKY: Liberty Counsel Tells Court That Clerk Is A "Conscientious Objector"
The Liberty Counsel yesterday filed a motion in the ACLU's lawsuit against four-times-married Kentucky county clerk Kim Davis in which they characterize her as being similar to an anti-war conscientious objector. The ACLU has seven days to respond to the latest motion. Earlier this month Davis testified that she had "prayed and fasted" about her decision to disobey the Supreme Court. The final ruling in the case is expected in mid-August. Kentucky's county clerks are elected and can only be removed by the state legislature, which is out of session until January. Davis and other renegade clerks face fines and jail for contempt of court should the ruling go against them.